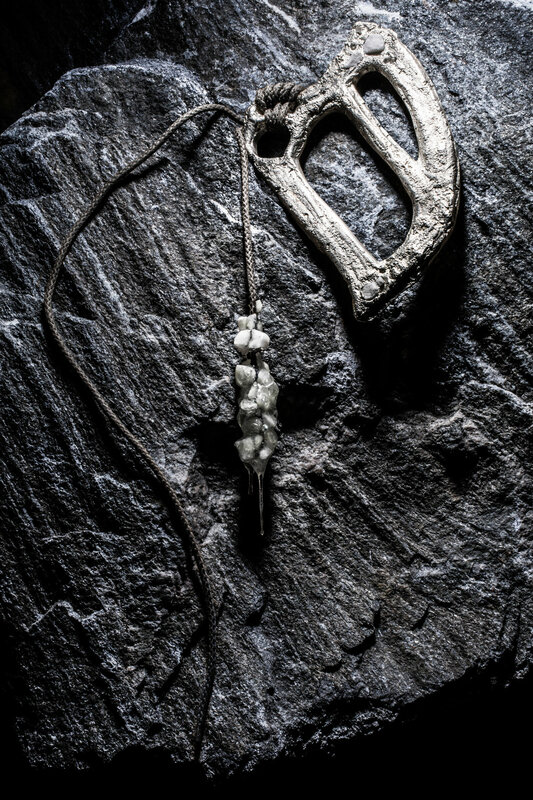 The EX90°00′00′′ men’s jewellery collection is dedicated to polar expeditions. Conceptually the collection evokes the spirit of exploration which is closely linked to such notions as identity and rite of passage. Climbing gear, survival equipment and various tools including ones from Inuit tribes and those dating back to the Ice Age are the main basis for the collection. The pieces are made of pewter and steel encrusted with marble, raw quartz, metal teeth and Swarovski crystals that are reminiscent of extreme cold. The unevenly self-braided and self-dyed rope is cast with the same materials set in silicone.